July 6, 1985 The Fiji Labour Party was launched under the aegis of the Fiji Trades Union Congress to fight the Alliance Party's growing insensitivity towards the plight of the workers and the poor. The inaugural meeting was held at Fijian Teacher Association (FTA) hall. It attended by FTUC executives, politicians, professionals and a record number of people. Some of prominent people in the inaugural meeting were, Dr. Timoci Bavadra, Mr. Navin Maharaj, Mr. Mahendra Pal Chaudhry, Mr. Jai Ram Reddy, Mr. Krishna Datt, Mrs Jokapeci Koroi, Dr. Tupeni Baba etc. The Suva City Council elections posed Fiji Labour Party's first test. The party contested all the wards and gave Suva its first Labour Party Mayor, Mr. Bob Kumar. All together FLP won eight wards. The Labasa, Nadi Ba Town Council Elections were also contested with Labour winning five, one and three wards respectively. It also won the well contested Lautoka Simla Ward by-election by a clear margin. 1986 Mr. Mahendra Pal Chaudhry narrowly misses the North-Central Indian Constituency by-election by a meagre margin of 204 votes indicating the growing support and strength gained by the fledgling Fiji Labour Party in just a short period of time. The Fiji Labour Party in coalition with National Federation Party won the General elections with an overwhelming majority. This was the first time in history of Fiji that a party apart from the ruling alliance had won the general elections so convincingly. Dr. Timoci Bavadra became Fiji's second Prime Minister. April 13, 1987 The Fiji Labour Party President and Leader, Dr. Timoci Bavadra, sworn in as Fiji's second Prime Minister and Minister for Public Service and Fijian Affairs. April 1987 The swearing in of the Fiji Labour Party and NFP coalition Government Ministers. Some prominent names were Mr. Jai Ram Reddy - Attorney General, The Finance Minister was Mr. Mahendra Chaudhry, Dr. Tupeni Baba was the Education Minister, Mr. Krishna Datt was the Foreign Affairs Minister etc. There was a real optimism in the country and the majority of people were looking forward to the new Government. May 14, 1987 The coalition government is deposed by a military coup, led by Major General Sitiveni Rabuka and the Cabinet and members of the government are held hostage for 7 days. The country is thrown into chaos and there is panic and fear among the citizens. Major General, Sitiveni Rabuka claims that he had carried the coup to safeguard Fijian paramountcy. There is widespread military torture on the general public, especially the Indo-Fijians as the military tries to impose its authority on the country. Several worshipping places are burnt by the Nationalistic elements in the community and Indo-Fijian religious functions are stopped by the military. The Sunday Ban follows as all businesses, sports and other activities are brought to a halt by the demands of the Methodist church leaders. June 1987 A delegation led by Fiji Labour Party Leader, Dr. Timoci Bavadra for the restoration of democracy in Fiji begins and discussions are held with Sir William Heseltine, the Queen's Private Secretary, the commonwealth Secretary General, Sir Shirdath Ramphal. The visit is followed by meetings with the heads of governments, trade unions and political leaders from Australia, New Zealand, India, United States, Canada, Papua New Guinea, and New Caledonia. September 23, 1987 The Fiji Labour Party Leader, Dr. Timoci Bavadra leads a delegation of his deposed colleagues in discussions with the defeated Alliance party headed by Ratu Sir Kamisese Mara. A political solution is found in the Deuba Accord. Signed on September 23, 1987, it is based on an agreement between the deposed government and the Alliance to share power. September 25, 1987 A second military coup takes place led by Major General Sitiveni Rabuka. The Labour Party Leader, Dr. Bavadra along with many of his colleagues and sympathisers are again arrested and held in detention at the Naboro Prison about 30 kilometres from Suva. This time the military abrogates the 1970 Constitution and imposes an interim government in Fiji led by the Alliance leader, Rt. Sir Kamisese Mara and members of his previous government. May 14, 1988 Fiji Labour Party activist for democracy arrested at Sukuna Park at the first anniversary of the coup, among them Dr. Atu Bain and Dr. Vijay Naidu. September 1987 -1989 The fight for restoration of democracy continues with Fiji Labour Party leading the way. May 14th is declared a black day in the history of Fiji and black bands are worn in remembrance and protest against the dreadful day. Various meetings are held with institutions and leaders of others countries as well as the Commonwealth. The Interim administrative is in the process of drafting a new racially biased and overtly discriminatory constitution. November 3, 1989 The leader of Fiji Labour Party, Dr. Timoci Bavadra who had been taken illand expires. Record 60,000 people attended the great leaders funeral five days later with schools being closed for the day in his respect. 1990 - 1992 Fiji Labour Party faces tough times during the years but still manages to fight for restoration of democracy and leads a very meaningful protest against the implementation of the racially biased and discriminatory 1990 constitution. Protests against the 1990 Constitution leads to the burning of the Constitution during Diwali by some members of the Party. June 1993 The failure of the Prime Minister, Sitiveni Rabuka to honour his part of the post-election accord and his rather offensive and contradictory statements about his agreement and intentions prompts the Labour Leader, Mr. Mahendra Pal Chaudhry to lead a workout of the parliament, withdrawing its support for the government. The Fiji Labour Party Secretary General, Navin Maharaj resigned as the Deputy Speaker. The Labour walkout forces Rabuka to act and within a week of the walkout, an extended Cabinet sub-committee was appointed to review the racially discriminatory 1990 constitution. September 1993 The Cabinet Sub-Committee draws up the terms of reference for a commission to review the constitution. The fact the terms of reference was not adequately protecting the Indo-Fijian interests prompted Fiji Labour Party to re-enter the Parliament to enforce changes to the terms of reference. Fiji Labour Party also wanted the commissions report subjected to scrutiny by a parliament select committee, a very important aspect not contained in the Rabuka/Reddy terms if reference. October 1993 Dr. Kanhaiya Simadri Naidu, a dedicated and active party stalwart passed away. 1993 Fiji Labour party works closely with government backbenchers led by Josevata Kamikamica and David Pickering (Member of All National Congress in opposition) to defeat the 1994 Budget. The defeat of the budget brings down the Rabuka government, but Fiji Labour Party efforts to appoint a caretaker Prime Minister to replace Rabuka was thwarted when National Federation Party (NFP) and its Leader gave his support to Rabuka to remain as Prime Minister. April 1994 Snap elections held and NFP played the race card blaming Fiji Labour Party for its post-election agreement pact with Rabuka. NFP waged a bitter communal campaign denouncing the Fiji Labour Party for backing the coup leader. Despite that, the Labour Party wins 7 seats and remains in the Opposition. More importantly, though FLP had only 7 seats, its support in the grassroots level remained intact with Labour amassing 47% of the total Indian votes cast. June 29, 1994 Founder member and long time party stalwart and supporter, Mr. Shiromani Madhwan succumbed to failing health, which kept him in hospital both here, and abroad for many weeks before his death. 1994 Labour Party's efforts a Joint Parliamentary Select Committee (JPSC) to review the constitution is rewarded and Labour Party MP's, Mahendra Chaudhry, Krishna Datt and Hardayal Singh are appointed to the Constitution Review Parliamentary Select Committee. August 1994 Labasa By-election held after the untimely death of NFP Parliamentarian, Shree Ramlu. FLP and NFP agreed on a compromised candidate Munsami Chinnakannu, as grassroots Indian opinion was strongly in favour of a unified approach to issues confronting the community. Elected unopposed. May 8, 1995 The party was shocked by the untimely death of Hardayal Singh in a car accident just two weeks before the Delegates Conference. Hardayal had won his parliamentary seat in the 1994 general election, defeating NFP President, Balwant Singh Rakka. 1997 The new Constitution was adopted after extensive consultation with all parties. The 1997 Constitution was passed by both Upper and Lower Houses without much opposition. 1998 Fiji Labour Party entered into a coalition with Fijian Association Party headed by Adi Kuini Speed, and Party of National Unity, headed by Tui Ba, Ratu Sairusi Nagagavoka, to fight the upcoming 1999 general elections. May 1999 Fiji Labour Party after running an extensive election campaign to address the plight the poor and disadvantaged, wins the majority of 37 seats and together with its coalition partners win 52 seats out of possible 71 seats. May 1999 Fiji Labour Leader and for the first time in Fiji's democratic history, a Fiji-born Indian, Mr. Mahendra Pal Chaudhry is sworn in as the Prime Minister of Republic of the Fiji Islands. May 1999 Peoples Coalition Government Cabinet sworn in with the Dr. Tupeni Baba and Adi Kuini Speed as the deputy Prime Ministers. May 19th 2000 A band of terrorists led by failed businessman George Speight storms the parliament with the help of Counter Revolutionary Warfare Unit soldiers and takes the government and its members hostage. The Prime Mininster, Mr. Mahendra Chaudhry and his son Rajendra Chaudhry together with his Cabinet Ministers and backbenchers of People's Coalition Government were held for 56 days at gunpoint. There was widespread violence and looting in the City of Suva. The City was in ruins with the aftermath of burning and looting by the Indigenous marchers and the the people were thrown into chaos and panic and were in fear for their lives at the sight of this rampage led by some prominent indigenous Fijian leaders. The whole country is taken into grief as the reality of situation settles and the country is once again thrown into the turmoil it came out from, only this time more serious and heinous. June 2000 Fiji's first ever-political refugee camp emerged amidst continued terrorism by the Muaniweni and Dawasamu landowners. The police and the army are unable to contain the continued terrorist acts and the tenant community flee leaving everything behind. 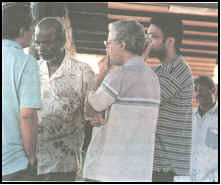 July 2000 The Prime Minister, Mr. Mahendra Chaudhry and members of his Peoples Coalition Government hostages are released. March 2001 Landmark ruling in the Chandrika Prasad appeal case whereby Fiji Court of Appeal judgement ruled in favour and upheld the 1997 Constitution. August 2001 The general elections saw the return of the majority of the Fiji Labour Party members back in the House of Representatives. However, a new Party led by Laisenia Qarase in coalition with nationalistic Matanitu Vanua forms the government. September 2001 SDL government fails to uphold the Constitution and the spirit of reconciliation by omitting Fiji Labour Party from the Cabinet. Fiji Labour Party mounts a challenge in the Court against its omission from the Cabinet. 2001 Opposition Leader rejects four nominees from the eight submitted by the Fiji Labour Party and appoints his four. Fiji Labour Party again challenges the decision in Court. October 2001 Fiji Labour Party Nadi Open candidate, Mr. Krishna Prasad, mounts a legal challenge against the Opposition Leader, Mr. Prem Singh, claiming that Mr. Prasad should be the legal representative of that Constituency. Similar cases are filed in Suva by FLP candidates, Mrs Lavenia Padarath, Joeli Kalou and John Ali. Judgement pending. February 2002 Krishna Prasad of Labour Party wins the case and is declared the elected candidate of Nadi Open Constituency. Opposition Leader appeals for a stay order against the decision even though there is no jurisdiction on the decision of the High Court. Appeal pending. March 2002 The Appeals Court rules that the Opposition Leaders nomination is unconstitutional and the President should call fresh nomination. April 2002 Chief Justice grants the Opposition Leader an extension on the stay order amidst growing controversy. April 2002 The High rules in favour of Fiji Labour Party stating that FLP should be included in the Cabinet. SDL contemplates appealing. April 2002 Seven Fiji Labour Party Senators sworn in the Upper House of Representatives.